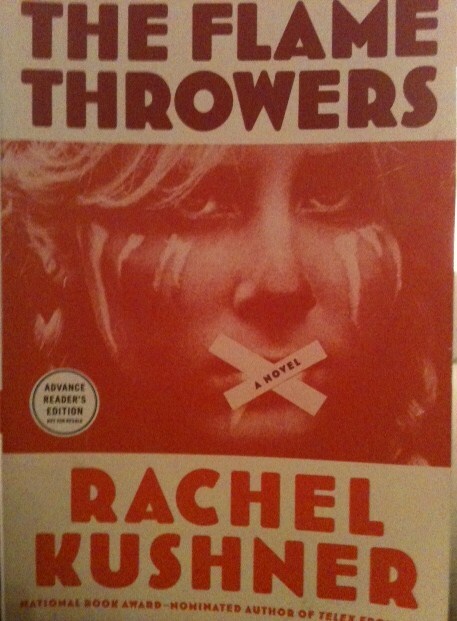 A few weeks ago, Mommy Jim was sent an advanced reader’s edition of novelist Rachel Kushner’s (of Telex from Cuba and 2008 National Book Award Finalist fame) latest work, The Flamethrowers* (released April 2 from Scribner in the US). The book, she noted, dealt in part with the Brigate Rosse and the New York art scene of the 1970s. 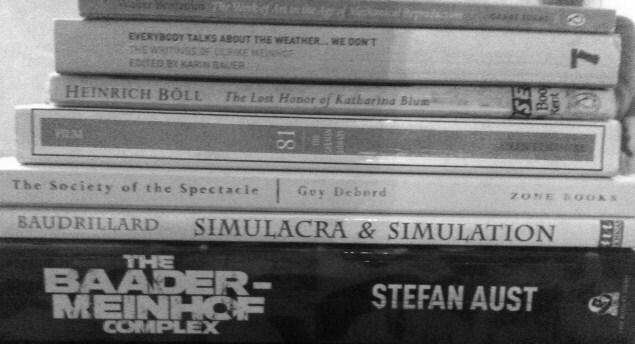 Since I studied Art History and English as an undergrad and given my interest in leftist political movements in 1970s Europe-- my mom researches and writes on director Rainer Werner Fassbinder, who didn’t see that daughterly interest a brewin’?-- Mommy Jim kindly passed the book along to me. Needless to say my interest was peaked and I spent the better part of a week hunched over the novel, waiting for the novel to live up to my expectations. Spoiler alert: it never did. The Flamethrowers follows Reno, a would-be-artist (nicknamed after her hometown) who moves to New York and, through a relationship with an older, wealthy Italian artist becomes a peripheral member of the city’s vibrant art scene. Though she spends her days among quirky, artistic people, Reno only makes half-hearted attempts at work of her own; rather, she spends the bulk of the novel acting as a sort of mascot for her older, morally corrupted friends. When Reno does attempt to an art project of her own-- capturing images of a motorcycle ride across the Utah salt flats-- it goes horribly wrong and ends with the young pro-artist falling, literally and figuratively, in with an Italian race team sponsored by her boyfriend’s family’s tire business (are you rolling your eyes yet?). Reno then becomes a Danica Patrick-like racing pin-up for the company and is invited to Italy for some promotional work with the team. After some hemming and hawing, Reno and her boyfriend go to Italy where, you guessed it, things once again go terribly wrong . . . and Reno kind of joins the Brigate Rosse, sort of. Or maybe not. I really wanted to like The Flamethrowers-- I really did-- but the novel is a profound disappointment. Reno spends the entire novel on the verge of something-- on the verge of developing her own artistic style, on the verge of racing fame, on the verge of being a member of a radical leftist group-- without ever doing anything. Instead, Reno passively ping-pongs between men who direct the course her life will next take; she is entirely devoid of agency within a socio-historic moment that was about claiming and utilizing one’s agency. This question of agency-- who has it, who claims it, who uses it-- doesn’t even amount to subtext; instead, Kushner distracts her readers with one winking New York in the 70s reference after another. “Forget about the act of becoming,” the narration seems to say, “here’s the Blackout of 1977! Here’s a generic Max’s Kansas City-type place! Pay no attention to the novel’s decided lack of depth!” The novel leads you to believe that something profound will happen to Reno, that within all that she has experienced, all the power she has relinquished to others, she will somehow, in someway come into her own-- she will be able to amalgamate all that she has seen into a profound work of art. But, by the end of the novel, Reno hasn’t acted on anything . 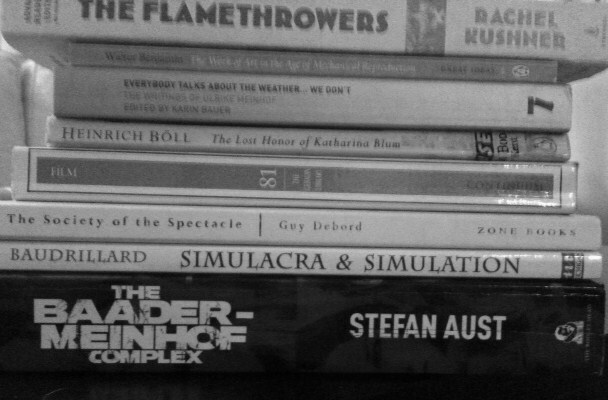 . .
After investing a week and almost four hundred pages worth of bus-reading efforts into The Flamethrowers, I expected more than Kushner delivered. *This book was provided to the author’s mother in exchange for a review on LibraryThing.com; a modified version of this author’s review appears on LibraryThing.com.